We’re big fans of Greek food, a cuisine drawing from the influences of both the ancients and the Ottoman empire. Mediterranean fare is generally fresh and healthful, and makes liberal use of seasonal vegetables, seafood and olives. 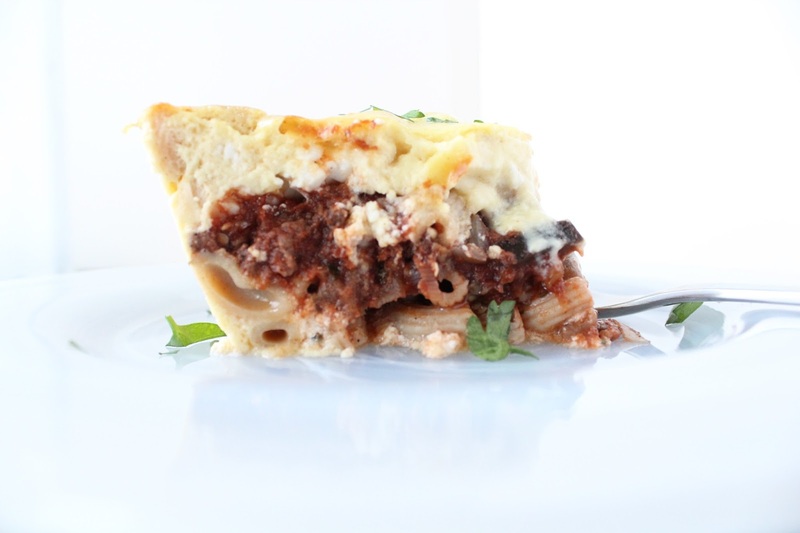 But, when we’re in the mood for an indulgence, we always find ourselves reaching for the creamy richness of moussaka. Perhaps the most widely recognized of all Greek dishes, moussaka is a casserole made by layering eggplant with a spiced meat filling, then topping it off with a creamy béchamel sauce that is baked to golden perfection. This mac n’ cheese mimics the flavors of the classic dish by layering cheesy pasta with a sauce made from ground lamb, diced eggplant, and fragrant spices. A creamy béchamel unites the layers and enhances the richness of the dish. We use Wisconsin Fontina in place of the less common Kefalograviera for its creaminess and flavor, along with Wisconsin cow’s milk Feta, which pulls in the briny, tangy notes commonly found in traditional Mediterranean fare. Don’t be intimidated by the long list of ingredients. This dish comes together fairly quickly, and offers you the opportunity to enjoy a glass or two of Greek Ouzo while it’s baking. The eggplant lamb mixture can be made a day ahead to save time. Check out this recipe, and a host of other delicious takes on macaroni and cheese over at 30 Days and 30 Ways with Macaroni & Cheese. And don't forget to enter their Mac & Cheese Please! giveaway to win a copy of Laura Werlin's awesome mac & cheese book. -- enter before March 1st! What a cool idea for a different spin on mac and cheese!